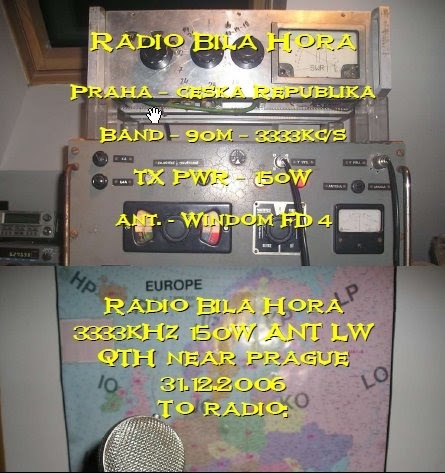 Hobbyist are speculating if the Euro pirate, Radio Bila Hora will recommence their annual New Year's Eve broadcast for 2018. If the station follows suit as in past years, they should broadcast on 3381.260 kHz. The station has also broadcast on 3334.82 kHz. Last year's broadcast was logged from 1500 - 2330 UTC, and heard from remote SDR units in Germany, Hungary, Norway, and Sweden. The station's power at one time, was reported as 150 watts, and the transmitter was constructed by one of the radio operators. The exact location is unknown, but was mentioned as "outside the territory of the Czech Republic." The 2017 broadcast included two anthems played at 2300, speech segments, pop and local Czech music. The 2017 broadcast also included a pre-recorded program presented by the former Czechoslovak pop singer, Richard Adams who was very popular in the 1950's and 1960's. Mr. Adams died in 2017 at age 86. He prepared the program for Radio Bila Hora several years ago, and the station presented it in his memory. The station's English ID as, "Radio White Mountain," is a reference to the historical significance of the Battle of White Mountain, the most famous battle in Czech history. On Sunday December 30th, FRS-Holland will traditionally ring out the Old Year with its Seasonal Broadcast on 7700//5800 kHz. Programs will run from 08:52- 14:05 UTC/ 09:52- 15:05 CET. changing and as a result, signals will likely skip large areas. For that reason the final three hours- starting just after 16:00 UC/ 17:00 CET- will go out on an extra 3rd frequency: 3975 kHz. many years ago. 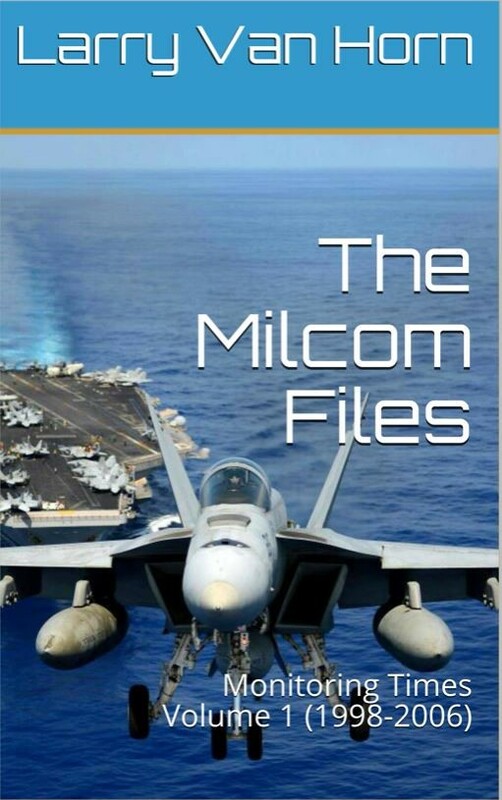 And a new edition of FRS goes DX will be aired including news from the world of (free) Radio. Just listen for yourself!! Important: it can happen that we are forced to change frequency during the broadcast. In such case FRS will publish it on the website. So...if there's latest news...you will find it at http://www.frsholland.nl/ at Latest News. express the wish that 2019 will become a peaceful, successful and healthy year ! probably be on the air Saturday-Sunday only. Power is only 200 W, which of course is a very low on the 19 meter band, propagation is quite poor on this band now - and the aerial (a simple dipole) is not very efficient so reception is quite difficult and irregular. So far - poor to fair reception in Southern Europe has been observed in daytime till around 1300 UTC and fair to good reception in Ireland, Scotland, western England and Iceland has been experienced during evenings around 17-20 UTC. 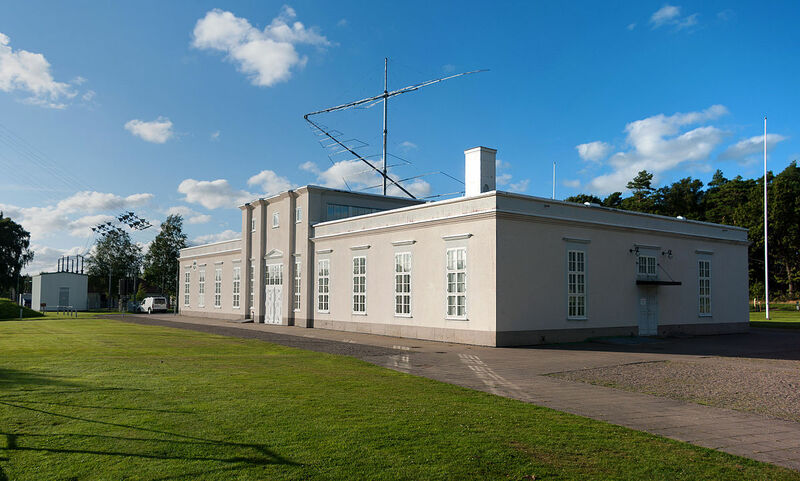 Transmissions on 5840 kHz continues 24/7 with a power of 100 W.
The transmitter site for 5840 as well as 15805 kHz is Randers, Denmark. Please note that the current QSL-design will be used for reception reports covering reception in 2018 only. A new design will be used in 2019. An eQSL is available for reports sent to wmr@wmr.dk - a reply can be expected within a month or so. A printed QSL is available for reports sent to World Music Radio, PO Box 112, DK-8960 Randers SØ, Denmark. Return postage is kindly required. For a fast reply enclose 5 euro or 5 USD (QSL will be mailed from Denmark, where postage rates are the highest in the world - 29DKK for a post card). If less return postage is enclosed, you will still get a QSL-card, but will have to wait some time till the QSLs can be mailed out from outside of Denmark. Please note that no QSLs are available for reports made by listening via remote receivers. No news as for 927 kHz Copenhagen. Still struggling to find a transmitter site there. 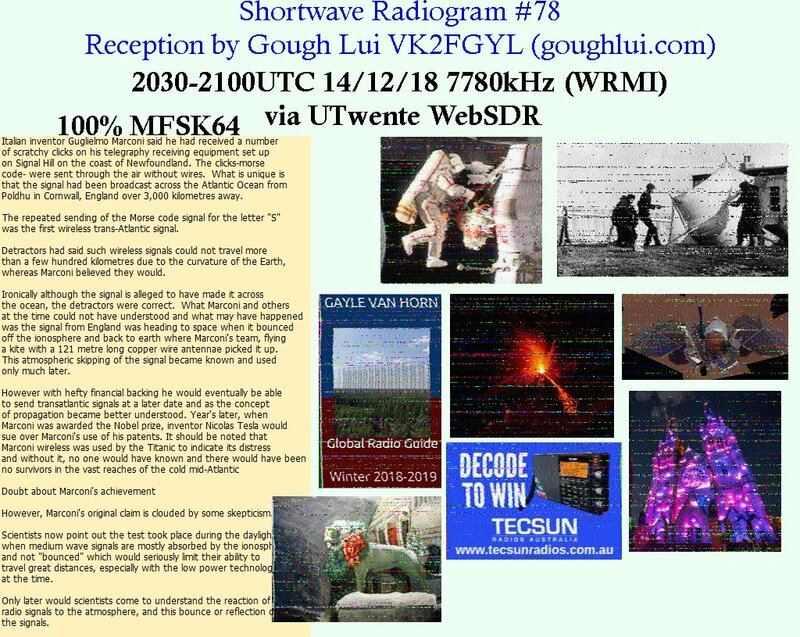 The humble municipal Christmas decorations featured in last weekend's program resulted in many nice shortwave-enhanced MFSK64 images, submitted by listeners via email and Twitter (@SWRadiogram). Some examples are below. Videos of last weekend's Shortwave Radiogram (program 79) are provided by Scott in Ontario (Friday 2030 UTC), Ralf in Germany (Saturday 1400 UTC) and Lolo sdr in Spain (Sunday 2330 UTC). The audio archive is maintained by Mark in the UK. Analysis is prepared by Roger in Germany. This weekend we stay with MFSK32 and MFSK64. 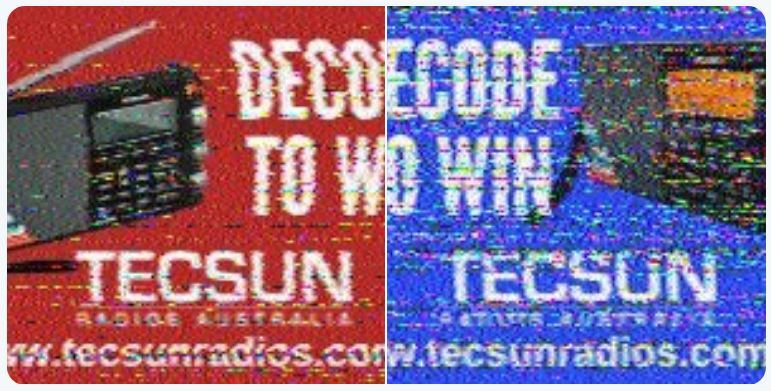 The show will include eleven images, including the second of six images in the Tecsun Radios Australia decoding competition. Slow Scan Radio transmits SSTV images and text modes Saturdays at 1300-1330 UTC on 6070 kHz (and maybe also 7440 kHz) via Channel 292 in Germany -- according to the latest schedule information I have. The website is http://www.slowscanradio.com. Reception reports to x@xdv.me. Broad Spectrum Radio is (sometimes) transmitted by WRMI Florida Sundays at 0700-0800 UTC on 5850 and 7730 kHz. 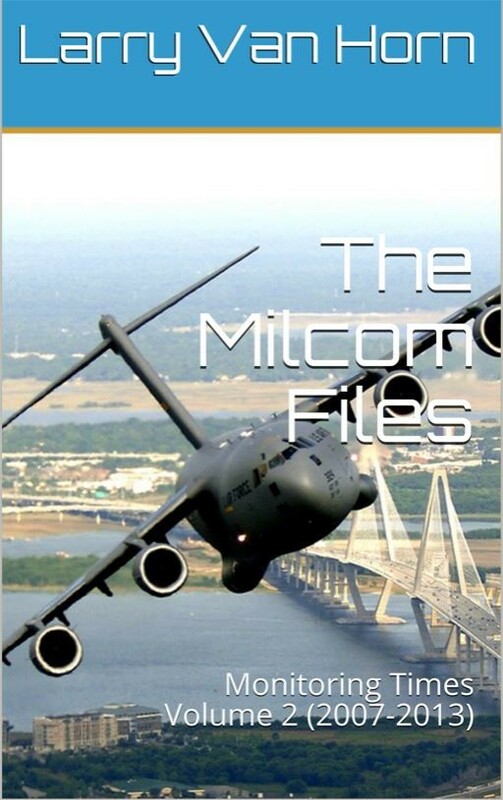 MFSK32 is broadcast during the second half hour of the show. Reports to broadspectrumradio@gmail.com. Thank you for listening, decoding, writing in, tweeting, producing videos, and for all your support in 2018. Wishing you a great 2019! Images decoded by Zach in Alabama, 21 December 2018, 2030-2100 UTC, 7780 kHz from WRMI Florida. Zach writes: "Don't laugh, but I always enjoying seeing the decorations that cities put up for Christmas! Ultra modern or totally old-fashioned, they're all getting me in the spirit of the season." Ralf in Germany received these images 22 December 2018, 1400-1430 UTC, 9400 kHz from Bulgaria. The Saturday 1400 UTC images were also received by Lorne in New Zealand. Al in Florida received these images 23 December 2018 during the 0800-0830 UTC show on 5850 kHz from WRMI Florida. 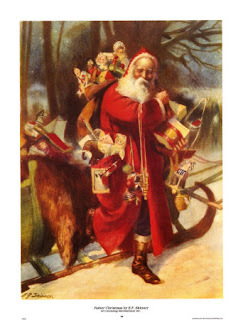 He wrote: "Visions of sugar plum images danced in my head as I set up FLDigi and settled into bed. In northern Florida not a creature stirred 0800z on 5850 kHz not even my mouse! Awoke & away to my Windows I flew like a flash to find Santa had left me this nice little stash... "
With some more distance from the Florida transmitter, Hal Fi in California decoded even clearer images on 5850 kHz. 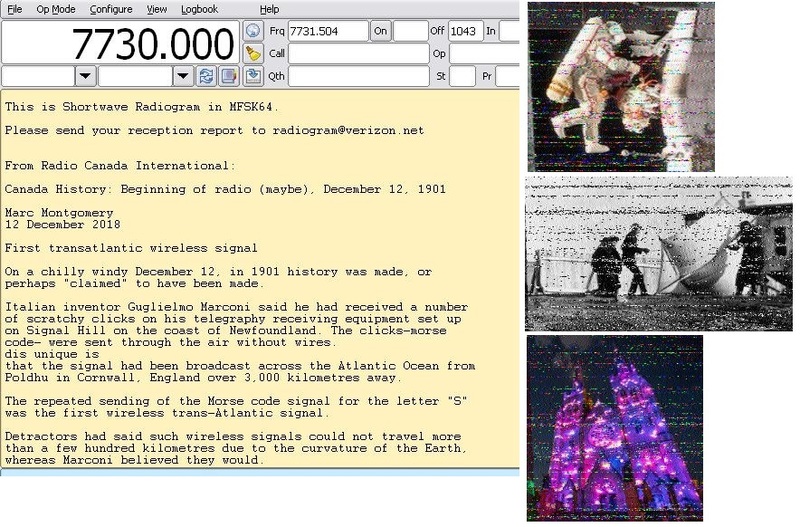 On 23 December, the 2330-2400 UTC broadcast, 7780 kHz from WRMI in Florida, was decoded by Marco in Italy. Solar activity was very low throughout the period. No Earth-directed CMEs were observed this period. The greater than 2 MeV electron flux at geosynchronous orbit reached moderate levels each day of the period. Geomagnetic field activity was quiet to unsettled on 18 and 20 Dec with quiet conditions observed throughout the remainder of the period. throughout the remainder of the period. Geomagnetic field activity is expected to reach active levels on 29 Dec, 04 Jan, and 16 Jan due to recurrent, CH HSS influence. Quiet to unsettled conditions are expected throughout the remainder of the outlook period. 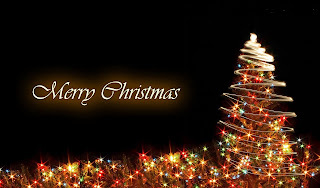 Teak Publishing wishes all of our global followers a very Merry Christmas in 80 languages ! 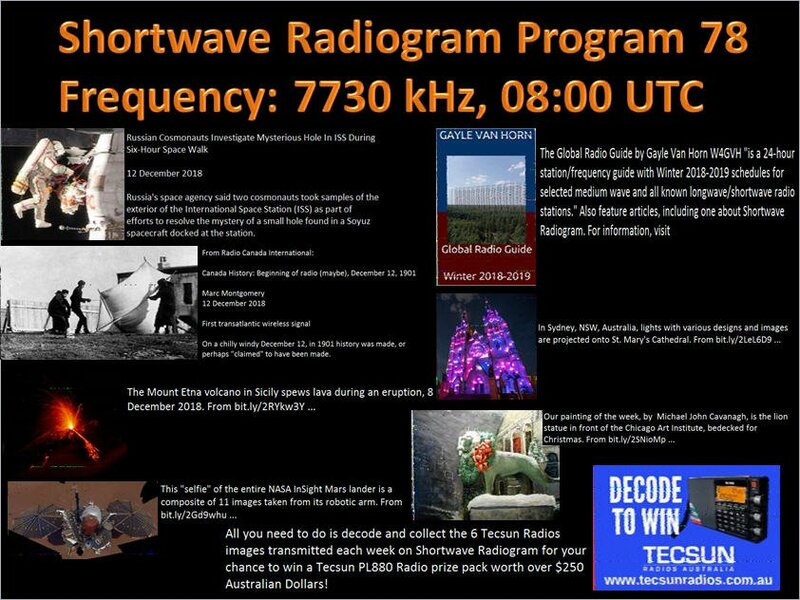 Hello shortwave listeners! I never like doing any self-promotion but nobody would know about this otherwise. 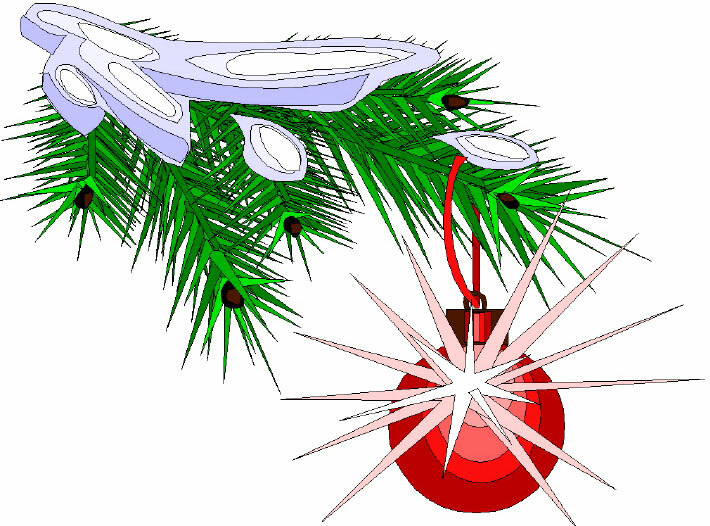 Coming up this Tuesday the 25th of December (Christmas) I will have a special onw hour program broadcast to North America on 9350 kHz via WWCR (100 kW) at the time of 2100 UTC, 3 PM Central or 4 PM Eastern. 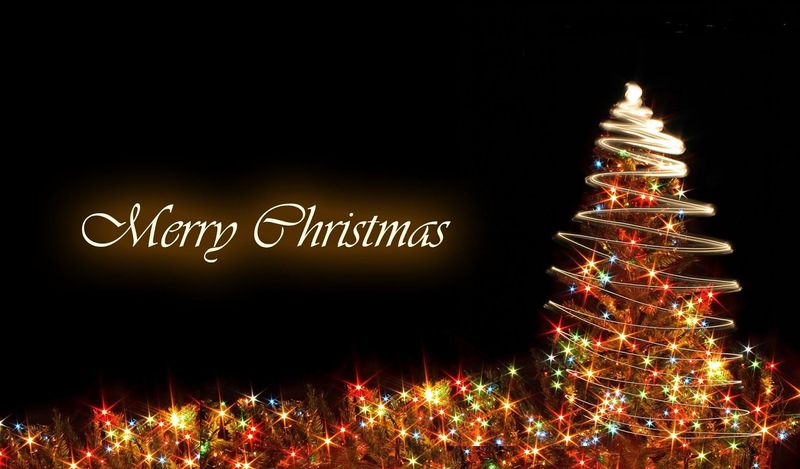 The show will feature some lively talk and mixed music - some Christmas tunes and some alternative/indie/classic rock music as well. I just hope for it to be a fun show on Christmas afternoon for whoever listens. Spread the word to any DX groups that might be interested. Feedback is most welcome at vorwinfo@gmail.com and I've even designed a special QSL just for this program. The transmitter will be tuned up from around 08:30 (07:30 UTC) and a message* will be transmitted at 09:00 (08:00 UTC). 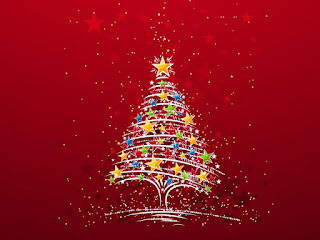 It has tradition and exudes a very special pre-Christmas mood: On Christmas Eve greetings are sent to the sailors from all over the world on NDR Info starting at 8:05 pm. And on the most different channels and technical ways, so that the greetings and messages can be guaranteed to be received on all seven seas. The ship's crews have several options to receive the message "Greeting on board". Also the shortwave belongs to it. The livestreams of the program (20.05 to 22 clock and 23.05 clock to 24 clock MEZ) can be found here: NDR Info and NDR Info Special . In addition, there is the possibility to listen to the program via the NDR radio app. NDR Info can also be received via FM, DAB + and DVB-S radio, NDR Info special only via DAB + and DVB-S radio. NDR Info sends the "Greetings on Board" from 20:05 to 22:00 CET. Then follows from 22 to 23 clock MEZ the transmission of the Protestant Christmette from the Neustädter Hof and Stadtkirche in Hanover. From 23.05 bis 24 clock MEZ there is the second part of "Greeting on board". From late in the evening you will find a recording of the show here to listen - for legal reasons, however, without much of the music recordings. 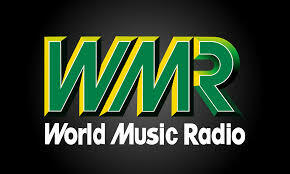 The staff at KTWR wants to give their listener's with DRM receivers, a Christmas gift this year. The DRM broadcast will be on the following schedule. Japanese will be at 350 degrees; ANZ will be at 165 degrees; and South Asia will be at 285 degrees. Previous IRRS programming was on 6075 kHz daily. For a QSL request of 16 Gwendoline Street, email your program details to gwendolinestreet@gmail.com. A brief run of QSL cards have been printed with the programs updated details. 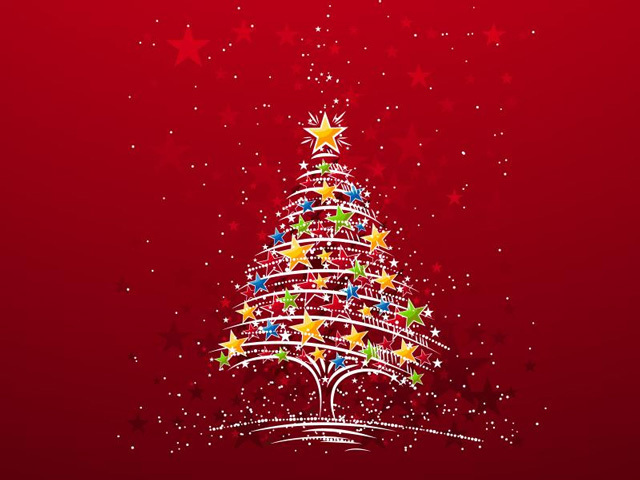 Don't forget to tune-in to 16 Gwendoline Street for the special Christmas programming. 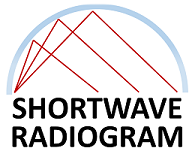 Videos of last weekend's Shortwave Radiogram (program ) are provided by Scott in Ontario (Friday 2030-2100 UTC) and Ralf in Germany (Saturday 1400-1430 UTC). Also, Paul in Belgium produced a video showing his decode an MFSK image by placing his Tecsun PL-310ET near his Android phone. Finally, three brief videos (one two three) from RadioMan96 in Russia. The audio archive is maintained by Mark in the UK. Analysis is prepared by Roger in Germany. Slow Scan Radio transmits SSTV images and text modes Saturdays at 1300-1330 UTC on 6070 kHz and 7440 kHz) via Channel 292 in Germany. 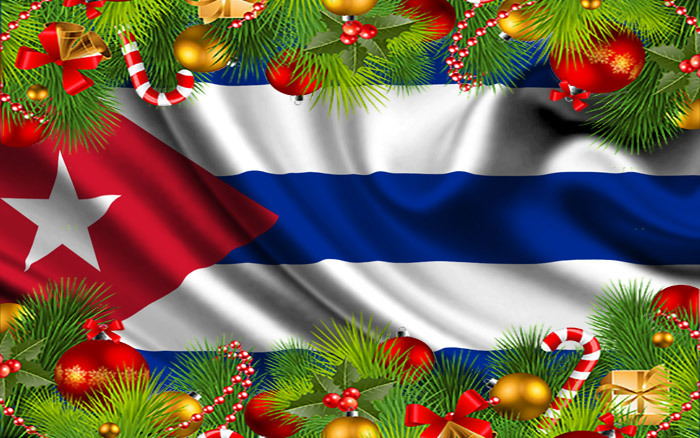 John will also have a special transmission 26 December at 2100-2130 UTC, also on 6070 and 7440 kHz. The website is http://www.slowscanradio.com. Reception reports to x@xdv.me. SV1XV in Greece received these images during the previews of the Tecsun Radios International competition, 7 and 14 December 2018. Gough Lui in Australia used the University of Twente SDR in the Netherlands to receive these images and text during the Friday 2030 UTC show. On 15 December, there was not much trans-Atlantic reception of the Saturday 1400-1430 UTC broadcast on 9400 kHz from Bulgaria, but Al in Florida was able to decode these images, including a very artistic St. Mary's Cathedral in Sydney. Lorne in New Zealand received these images Saturday, 1400-1430 UTC, 9400 kHz from Bulgaria. 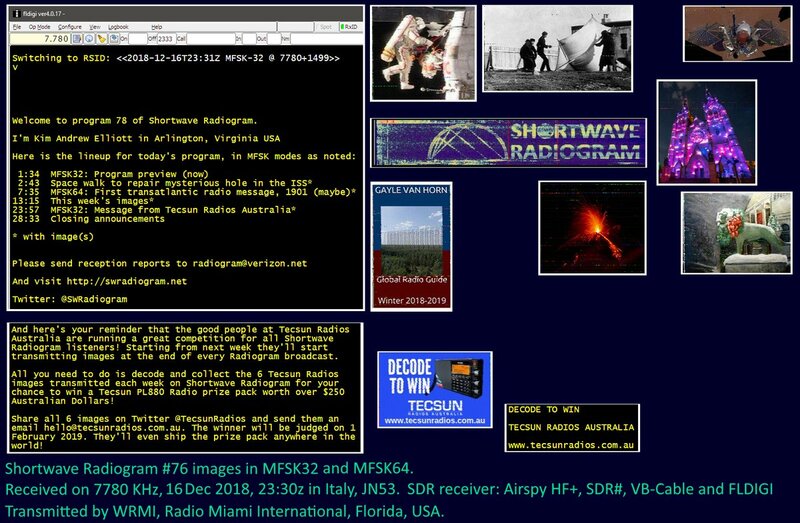 Also the image (top left) from The Mighty KBC, 1330 UTC, 11600 kHz, also from Bulgaria. 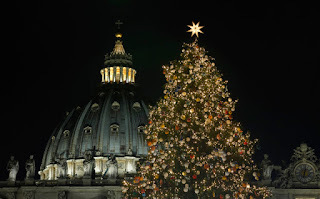 The winter solstice, plus or minus, is the time to receive the Sunday 0800-0830 UTC transmission in Europe. Frederic in France received these images and text on 7730 kHz from WRMI Florida. Carroll in Oregon had good reception of text and images Sunday at 0800 UTC. Marco in Italy stayed up late and was rewarded with good images and text during the Sunday 2330 UTC broadcast. Copyright © 2018 Shortwave Radiogram, All rights reserved. You are receiving this email because you sent an email to Shortwave Radiogram or VOA Radiogram. You can unsubscribe by using the link provided. Throughout our modern world, there are many remarkable and spectacular bridges. The longest bridge in Europe is the 7½ miles long Vasco da Gama Bridge that crosses the Tagus River in Lisbon Portugal. The bridge with the tallest piers in the world is also found in Europe. The Millau Viaduct Bridge in France is suspended from seven tall towers, one of which stands at 1125 feet, a little less than a quarter mile. In the United States, the iconic Golden Gate Bridge in San Francisco is a dramatic suspension bridge 1¾ miles long that is sometimes photographed with its upper structures above the cloud line. This now more than 80 year old bridge carries more than 100,000 motor vehicles daily. The General Belgrano Bridge in Argentina South America is one mile long and it spans the Parana River, thus connecting the two cities, Corrientes and Resistencia. Another spectacular bridge in South America is the Orinoquia Bridge in Venezuela. This three mile long roadway and railway bridge crosses a small island in the Orinico River. Three countries; Dubai, South Korea and Vietnam; have each erected spectacular bridges that now spurt waters that are lit in color at night. It seems that China can boast the most superlative bridges in the world. Their Danyang-Kunshan Grand Bridge is a high speed railway bridge that spans the Yangtse River Delta in China for 102 miles, the longest in the world. Their Duge River Bridge is the highest in the world. It is a roadway bridge three quarters of a mile long and it stands more than a quarter mile above the gorge below. China has also erected several spectacular tourist bridges with panels of glass up to six inches thick. Many pedestrians are terrified at crossing any of these high level bridges, one of which has a specially prepared area that gives the fake appearance of cracking as it is crossed. Towards the end of October 2018, China opened the world’s longest over the ocean bridge in the world. This new China Bridge spans 34 miles of open sea waters across the Pearl River Estuary and it joins formerly Portuguese Macau with formerly British Hong Kong, and with Zhuhai in mainland China. This mega-bridge system cost the equivalent of multi-trillions of dollars to construct and to establish for daily usage, and it was built to withstand massive earthquakes and the strongest of typhoons. 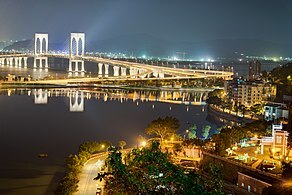 The islands of Macau, at the farthest extent of the New China Bridge, were a Portuguese colony for around 500 years. This territory is considered to be the world’s most densely populated area, with a total population of two thirds of a million people. Macau still issues its own currency even though the territory was absorbed into mainland China at the turn of the century. Tourism makes it one of the richest territories in the world, with an influx of more than 20 million visitors each year. On the wireless/radio scene, the Portuguese authorities established a small wireless communication station in Macau soon after the end of World War 1. This new facility with the callsign CRS was installed on Siac Island, a small island of ¾ square mile, just off the main populated area of Macau. The callsign CRS seems to indicate China Radio Siac. Then in 1925, as reported by the American monthly journal, Radio News, there was a small low powered radio station on the air in Macau, in March of that year. This new station, we would suggest, was an amateur radio station installed privately on Macau Island, and it was in use occasionally for the broadcast of entertainment and informational programming, as was the custom for amateur radio stations back then. Radio News described the station as an excellent station. Macau Island itself was originally an island of 3¼ square miles, though land fill has subsequently joined the island to mainland China as a peninsula. The crossover point between Macau and mainland China is just 1,000 yards wide. In 1933, a new communication station was installed in Macau under the callsign CQN. This 500 watt shortwave station was noted occasionally in the United States, as well as in Australia and New Zealand. Even though it was specifically a communication station, yet occasional radio broadcast programs were noted in the 49 metre band. 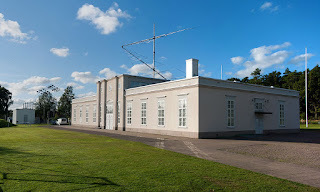 Four years later (1937), station CQN was closed in order to renovate the ailing transmitter. Then on December 26 in the next year (1938), the station was again heard back on the air in Australia, though now under a new callsign. Shortwave station CQN had became CRY9, and it was still operating in the 49 metre band. The utility communication station CRY9 was owned and operated by the government of Macau, and the entire facility was housed in the relatively new Post Office Building which was located at the intersection of Senado Square and Avenida de Almeida Ribeiro in Sé, Macau. This communication station was on the air with program broadcasting for just a couple of hours one evening a week. Their chosen channel was usually 6080 kHz, and they were listed officially with 500 watts, though in reality it was only about half that power, at 250 watts. With the ever increasing threat of Japanese aggression in mainland China, and the possibility of some form of involvement for Portuguese Macau, the government broadcasting service established a Foreign Service that was broadcast by their 250 watt transmitter in the 19 metre band. This new international program service was officially inaugurated by the territorial governor, His Excellency Gabriel Maurício Teixeira, on May 28, 1941. Programming during that era was broadcast in Chinese, Portuguese and English. A 1947 listing of communication stations worldwide shows station CRY Macau on the air with four different shortwave transmitters ranging in power from 300 watts up to 2½ kW. 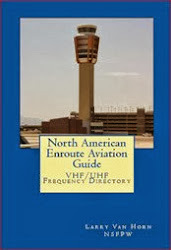 Each shortwave channel was listed with a CRY callsign, followed by a suffix number indicating the specific frequency. Then, a much later listing in 1978 shows the communication station in Macau under another new callsign, this time XXF. More about the radio scene in Macau and Hong Kong, another time. NHK World Japan, is launching on January 15th of next year (2019) a new online Chinese-language service. NHK Huayu Shijie will broadcast some of the most popular programs that focus on news, culture and current events. The program will also have a trends feature, give medical information and air a documentary from the Asian region. Nanami Sakuraba, presenter of the program, said that she hopes the service can introduce emerging trends in Japanese culture. NHK Newscaster James Tengan said he will prioritize objectivity and neutrality when he reports the news. 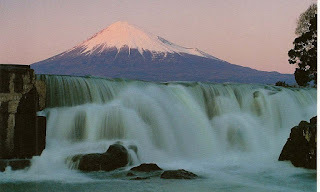 NHK announcer Chiaki Kamakura said that more than 30 million people have visited Japan this year. She added that about half of them speak Chinese so it makes sense to provide them relevant information. The number of foreign visitors is expected to grow with the Tokyo Olympics and Paralympics in 2020 and the World Expo in Osaka in 2025. While performing internet research on the Kerala medium wave stations a while back, we came across an item of surprising information. Surrounded by the state of Kerala on three sides, with the Arabian Sea on the west, is a small territory of just three square miles known as Mahe. Apart from border irregularities with Pakistan and Bangladesh and Myanmar, this Mahe must be one of the very smallest political territories in mainland India. 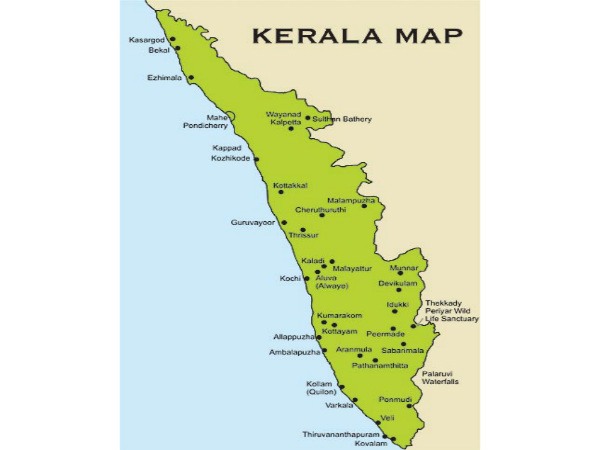 This Mahe enclave is geographically, and racially, and linguistically, a part of the territory of Kerala on the west coast of India, though these days it is politically part of a territory some three hundred miles distant, over on the east coast of India at Pondicherry. This is what happened. Back in the colonial days the French also (in addition to the English and other European powers) established several trading posts, military forts, and small isolated colonies on the Indian subcontinent. These extra-territorial enclaves, about a dozen in number, ranged in size from just a small commercial building up to Pondicherry, the major French territory in India, with a total area of about 200 square miles. All of these once-upon-a-time French territories were absorbed into the Union of India soon after the end of World War 2, and four of these previous enclaves are these days administered directly by the Government of India as a single unit. Pondicherry is the chief territory, and the three other smaller territories, Karaikal, Yanam and Mahe are linked with the administration in Pondicherry. The French enclave of Mahe on the west coast of India was generally part of the French empire right up until the year 1954. At this stage, Mahe was taken over by India, seven years after British India was accorded independence as the Union of India. These days, this Mahe is considered to be part of ex-French Pondicherry, and hence, under the Union government of India, it is administered by Pondicherry as part of a Union Territory. The ex-French enclave of Mahe is located on the west coast of India, towards the northern end of the Indian state of Kerala. It is just a small territory of some 3 square miles at the mouth of the Mahe River and it is surrounded by the state of Kerala on three sides and the Arabian Sea on the west side. Mahe has a resident population of some 41,000, and three languages are recognized as official languages; Malayalam, French and English. 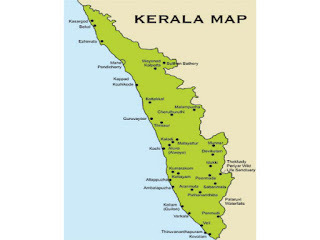 Major radio coverage for the small enclave of Mahe is provided by the 50 mile distant All India Radio station at Kozhikode or Calicut as it was known under the British. This powerful mediumwave station emits 100 kW on 684 kHz over a wide area, and thus it provides a good signal into Mahe also. However, there is indeed a small radio station in Mahe, or more exactly, in New Mahe, just across the river from Mahe itself. This small community radio broadcasting station is housed in the Post Office Building in New Mahe and it is operated by the Academic & Technical Education Development Society. Community FM station Radio Janvani operates on 90.8 MHz with just 50 watts. In addition in the state of Kerala, there are more than 40 FM stations, three quarters of which are on the air as community radio stations. AIR All India Radio also operates a dozen FM stations, five of which provide coverage in regional cities, and in shadow areas as slave relay stations. Thus far in our sequential features regarding the mediumwave scene within the Indian state of Kerala, we have presented the story of their four mediumwave stations. In a list of mediumwave callsigns in India as published during the year 2011, it becomes apparent that a three letter callsign is composed with the first two letters VU for India, followed by a third letter, which is the first letter in the name of the city. Where there is more than one city whose name begins with the same letter in the English language alphabet, then a suffix number is added. QSL cards verifying these four mediumwave stations can be obtained from AIR headquarters in Delhi, and QSL letters may be obtained from each of the mediumwave stations in Kerala for reception reports sent direct to the station. However, in addition to these four mediumwave stations as listed above, there is also one other, and it is located on a nearby island where the Keralese language Malayalam is spoken. This territory, the Lakshadweep Islands, is associated with Kerala, though it is officially a union territory under the direct administration of the central government in New Delhi. On one of these islands is another mediumwave station operated by AIR All India Radio, and that will be our story on the next occasion when we present information on the radio scene in India.